HAS WORKED WITH MG IN 2016. A native of Mendoza, Guarnieri is deeply inspired by terrain; Her paintings are reflections of place and atmosphere and all that goes into it: sun, soil, population,.. traffic, mountains, architecture and storms... She cites the warm, sunny climate of Mendoza for her choice of favored pigments: carmine, orange, golden yellow, burnt sienna, turquoise and raw amber. Instead of interpreting her landscapes literally, Guarnieri’s paintings of cities and nature are abstracted and energetic reflections of her experiences in different locations. She has a talent for capturing and conveying the emotions of a city or environment on canvas. The artist says that she wants her paintings to provoke excitement, fun, motivation and revolution in her audience, and she hopes to expand and enhance the lines of communication between people through her expressive use of pigments. 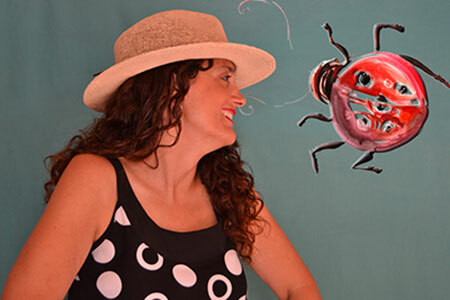 Valerie Guarnieri is a graphic designer, specialized in graphic art. Her work combines her vast experience as a designer, an undeniable understanding of the fine arts, good taste and originality. With the expansion of the wine growing business, the need for an indigenous artistic expression became obvious and Valerie was asked to transform her paintings into labels. Soon after, more of her illustrations and sculptures were adapted for use in the rapidly booming winemaking business that has brought overnight prosperity to the Mendoza region of Argentina. Valerie became a key contributor to the artistic side of this growing commerce and she stands out as one of the only artists who has successfully combined art with graphic design and communication. As an artist, her natural curiosity led her to different techniques, experimenting with acrylics, oil and watercolor. However, being a colorist is a characteristic that makes her remarkable and proudly unique. She graduated from the prestigious Arts and Design School of National University of Cuyo in Mendoza, Argentina and, even as a student, excelled in her creativity and originality in designing wine labels.